Calling all vanilla lovers! Very Vanilla Creams pack intense flavor into a small package. These smooth cream candies feature four different vanilla ingredients for the ultimate in pure vanilla taste. You can substitute white chocolate chips for the vanilla candy coating if you desire, but depending on the temperature of your kitchen, you may need to keep the creams in the refrigerator to prevent the chocolate from getting too soft. 1. Prepare the vanilla pod by splitting it in two and scraping out the seeds. Set the seeds aside for now and discard the pod or save for another use. 2. Place the butter in a medium saucepan and heat it over medium heat until the butter is melted. Pour in the pudding mix and stir until the mixture is smooth and well-combined. 3. Slowly pour in the milk and continue to stir until mixture is smooth. Continue to cook over medium heat, stirring, until mixture is very thick and pulls from the sides of the pan. 4. Remove the pan from the heat and stir in the powdered sugar, vanilla seeds and vanilla extract. Allow the candy to sit for 5-10 minutes, until cool enough to handle. 5. Form the mixture into about two dozen small 1-inch balls and place on a foil-lined baking sheet. Place the candies in the refrigerator to chill for 30 minutes. 6. Place the candy coating in a microwave-safe bowl and microwave to melt the chips, stirring after every 45 seconds to prevent burning. 7. Once the candy coating is melted, dip the creams in the coating and place them back on the baking sheet to set. If desired, top each candy with sprinkles or other decorations while the chocolate is still wet. 8. Once firm, serve immediately or store in an airtight container in the refrigerator for up to a week. Allow the creams to come to room temperature before serving. Click Here to See All Fondant & Cream Candy Recipes! 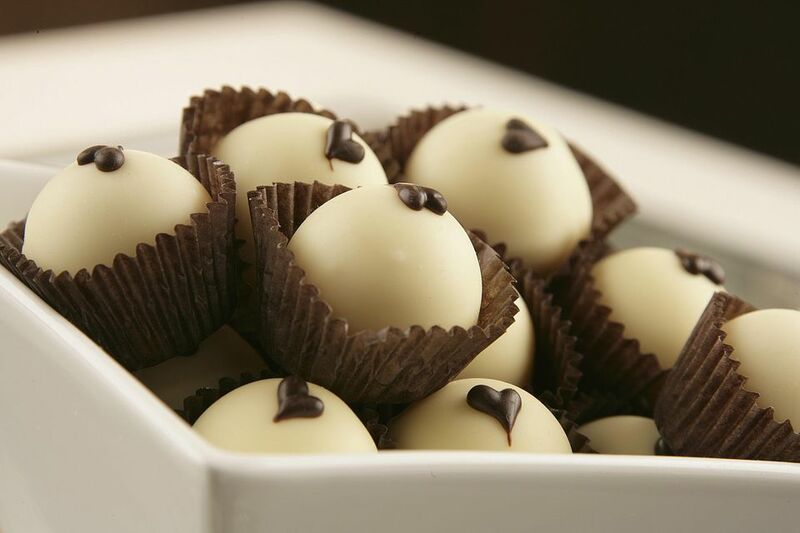 Click Here For More White Chocolate Candy Recipes!